Do you ever find yourself just staring at your computer wondering how you’re going to make a living working from home? You’ve read every blog out there, filling your mind with the plethora of ideas, jobs, and ways to make money online. Some sound promising. Most you blow off. And as you realize you’re not getting anywhere by staring at the screen doing nothing, you decide to try anything. Maybe transcription. Maybe a few online surveys. Whatever you do, the money you make is pitiful and you know there’s no way you can make enough to live off. Coming up with a legitimate way to work from home AND make a living in the process is a daunting task, especially when you need it now. And if you’re new to all this, the intel you gather through your reading is so overwhelming it’s no wonder you walk away from your computer empty handed. 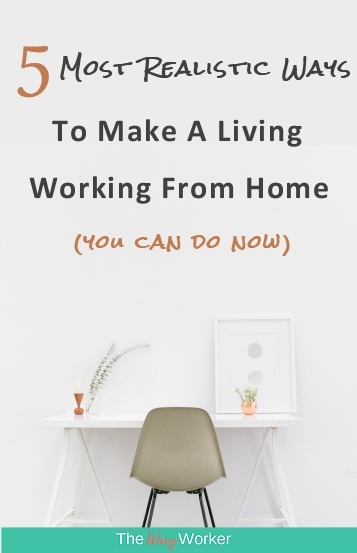 So, Here are 5 Realistic Ways to Make a Living Working From Home. There are a ton of jobs where you can work from home. Really. But you know this already, right ? You know what I’ve noticed ? A lot of people take any old job just because it’s something. Even if the job doesn’t fit. And it’s not long before they have to move on to something else. And the more they look, the more things look the same. The trick here is finding the ones that fit your needs. So how do you get one of those work at home jobs where you can actually make a living? Start by getting real with what you really want. Is it a flexible schedule you want? Need something that lets the kiddies hang around? Want to work weekends or nights? Don’t over-extend your expectations. If you know you can’t work after 3:00 p.m., skip all the jobs that want you to work the afternoon shift. If you can only work 4 hours a day, look only for jobs that are part-time. Do I hear a collective “but I have to look at all the jobs to see which ones fit…” ? Ya, you probably do. But you don’t have to apply for them. Because the truth is, with so much competition for legitimate, well-paying work at home jobs, a lot of applications get tossed in the garbage because the hiring manager knows right off the bat who fits the role. So, when you apply for the job you wait. And wait some more just to hear if you get an interview. Applying for more jobs in the meantime. Even if the job doesn’t fit. You need to break the cycle of looking, applying, waiting. Looking, applying, waiting. Looking, applying…(you get the idea). And start the cycle of looking, applying, getting. Be picky. Apply to the positions that fit, even if it means you have to look at a lot of jobs. Don’t get me wrong, I know there’s nothing wrong with doing a little bit of “extras” to get some money rolling in, but keep this as a short-term fix. Going from one “extra” to another takes up a lot of your time. Like I said, be picky. 30 companies that frequently have remote job openings. I gotta say, this is the easiest – and the hardest – way to make a living from home. Anyone can start a blog but not all blogs are successful. It’s a slow, tedious process and a lot can go wrong. But with the right tools and knowledge you can rake in thousands of dollars each month, just like this personal finance blogger and this passive income blogger. When I started my gardening blog I thought I knew more about blogging than I actually did. It wasn’t until I started up The Wary Worker that I realized I knew very little. So I did a lot of reading, took a few online classes, and soaked up all the “make money blogging” info. I could handle. I still don’t know squat. That’s because the blogging world is always changing. Search engines change the way they rank blogs, social media platforms come and go, and influencers are getting harder to reach. But I didn’t let that stop me. You see, I want to do this. I want to help people with the information I provide. That’s my drive. You know the successful blogs I mentioned above? They’re extreme cases of success. And they’re successful because they work at it. Hard. Not only have they been around for several years, they probably went through growing pains and learned from their mistakes. And, most importantly, they are chock-full of valuable stuff people search for. So, to get you on the right track to being a successful blogger (and to prevent re-hashing the same stuff) I want to direct you to an article I wrote on how to start a blog to make money. You’ll learn the first steps to starting a blog, like what platform to use, how to get a name, and how to get the ball rolling. Then, once you have some knowledge under your belt, this WordPress for Beginners online course will show you how to build your blog. I took it and recommend it to anyone who is just starting out. It walks you through WordPress from start to finish…and a little in between like how to secure your blog and which plugins are worth using. Note: Because TheWaryWorker.com believes in transparency, if you sign up for that WordPress course using the referral link, I get a little bit of a commission. This is at no extra cost to you – you pay whatever the course costs ($10.00 right now) and they compensate me. Most of the information in the WordPress For Beginners course can be found all over the web but I have not been able to find a source (that I like) that has it all in one place. No doubt, companies are changing the way they reach-out to their customers. Technology and social media resources have seen to that. And because of this, the variety of career choices is exploding. Sure, you can still get a job doing telephone customer service. You can also get a job managing someone’s Pinterest profile. The main point I want to make here is don’t limit your career choice. Go ahead and broaden your horizons so you can make a nice living from home. This is the kind of job that is really taking off. Big time. And because this is such a hot job, you have the freedom to work either as a freelancer or an employee for a company. There’s that much of a need for this kind of work. Covering duties from social media ad campaigns to developing content strategies, the main goal is to create high-impact growth initiatives. And this kind of job pays about $20.00 per hour. Museam Hawk, Hotjar, Toptal, and Hubstaff are a few companies that often hire Growth Marketers. A lot goes into managing a blog, with WordPress being the most common platform used. Lucky for us, companies need people to handle this stuff for them. What does a Blog Manager do? In my opinion, the best place to find blog related jobs is here, the Pro Blogger job roll. Wanting to take customer service to a whole new level, many companies now identify their Customer Service Representatives as Happiness Heros, Joy Creators, or Customer Onboarding Specialist. Whatever you call it, the main emphasis is providing top-notch service by phone, email, or chat. And companies accomplish this by offering you – their newest customer service representative – a nice selection of benefits. Deal Dash, Customer.io, Doist, Hertz, Capital One, and American Express are just a few companies that frequently hire. And you get to work from home! Automattic, Buffer, and Zapier sometimes hire specialists to communicate to customers through chat and email. In other words, ask your boss if you can telecommute. Heck, if you already have a job you like, why not? What have you got to loose? First, though, you have to convince your boss. And bringing up the topic might be dicey because many managers loose the ability to manage. Is your job suitable for telecommuting? How will it benefit the company (more productivity due to fewer interruptions, less time away from the office dealing with kid stuff…)? Now, when building your case, let your boss know you have the space and discipline to work from home. Prove you have the tools to get the job done. And I don’t mean a desk and telephone, I mean a decent internet connection, printer and communication tools like FaceTime and Skype. I’m not really talking about starting a full-fledged business here, I’m hardly an expert in this area so I don’t want to go down this road. But you can do your own “thing”. You can be the boss of YOU without the burdens that come with running a business. You know you have skills and talents, so why not build on that…and make money. In #3 above, I touched on the idea of Pinterest Marketing. This is a new trend in social media marketing that more and more blog owners are jumping into. And the need to have someone do it for them is skyrocketing. Believe me. I don’t want to spend the small fortune on an automated process to pin my posts but I would pay someone to pin on my behalf. I have come to embrace a few places that are all about showing off and selling your knowledge and skills. Creative? Etsy, Craftsy, and Handmade By Amazon are arguably the best places to expose your crafts. So there you have it, 5 realistic ways to make a living working from home. You can pick one of them, or all five, but know you have the ability to work where you are most comfortable.